No it is not antique, just a few years old. 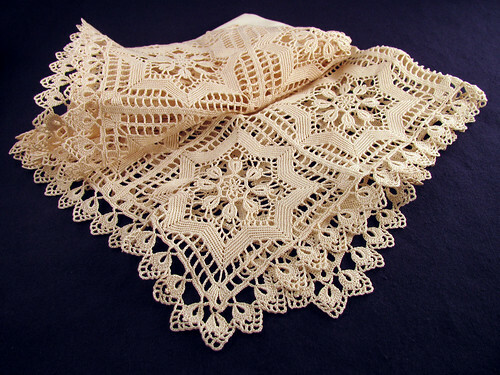 I crocheted it from an antique pattern. I didn’t want to take the time to block it nicely for a photograph. It does look old with all the wrinkles. I added a center of Aida cloth which wasn’t the best idea. Aida cloth is too stiff. The stitch count was the same gauge as the crochet so it was an easy thing to match the stitches. I do not know what I am going to do with this piece. A lot of work went into it. Here is a close up of one motif. I think the center ring sould have been done better. At the join the side ridge of the stitch is missing. It should continue the circle and make a complete ring. There is a way to do that, I guess when I made this I didn’t know how to yet. 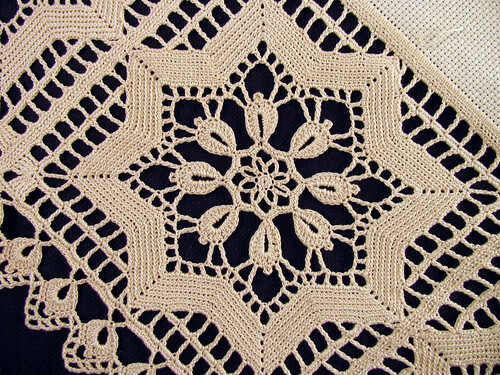 This entry was posted on Sunday, February 1st, 2009 at 3:00 am and is filed under Crochet and Lace. Tagged: Crochet, Lace, Thread. You can feed this entry. You can leave a response, or trackback from your own site. That’s a beautiful piece. I like to work on antique patterns too. They have a little charm to them.